Containing, for many, the highlight of Yellowstone National Park, the Upper Geyser Basin has the densest concentration of hydrothermal features in the world, including the always dependable Old Faithful Geyser. There is a lot to explore here, and within its two square miles, more than half of Yellowstone’s 300 geysers can be found, ranging from the regal Castle Geyser to the thermophile-filled Morning Glory Pool. The 1.5-mile boardwalk trail of the Upper Geyser Basin and Geyser Hill follows along the Firehole River and provides plenty to admire. 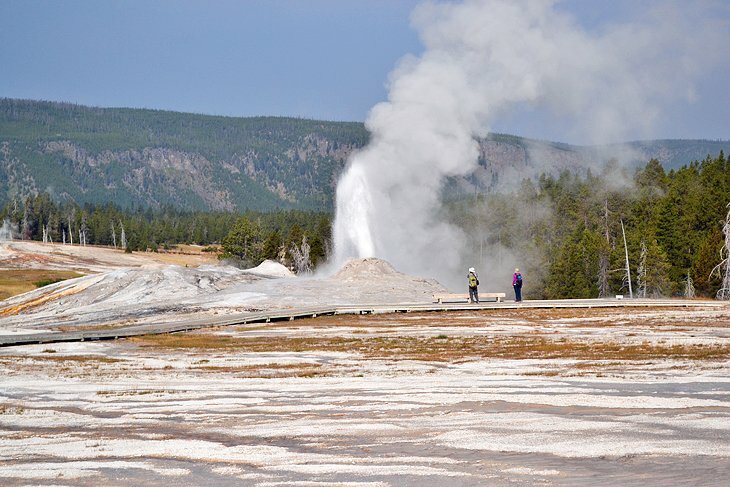 With predicted eruption times for five geysers along the boardwalk, including Old Faithful, there’s always a good chance of catching a hydrothermal reaction. The Upper Geyser Basin Boardwalk deserves a strolling pace, and between the erupting geysers, burbling hot springs, and fuming fumaroles, this dynamic area really does define what makes Yellowstone so unique. After you’ve finished seeing, smelling, and hearing the active Upper Geyser Basin on the boardwalk trail, it’s easy to extend your adventure into the surrounding area. Other great day hikes, like the Lone Star Geyser Trail, are close by, and the Midway Geyser Basin is only a short drive away. Adjacent to the Old Faithful Geyser, the historic Old Faithful Inn, established in 1904, provides an impressive, rustic dining hall and timeless accommodations. Next to the Inn, the more-modern Old Faithful Visitor Education Center can provide you some valuable information about the area.